A bottom rejecting coin validator using accurate measurement technology with a large number of options for credit counting and vending-machine communication. 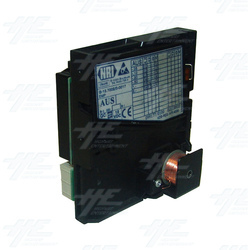 Ideal for applications independent of mains supply with low power consumption. With "Teach Mode", tokens are able to programmed on site. Can be configured for two individual settings with 2 x 12 channel technology. A bottom rejecting coin validator using accurate measurement technology with a large number of options for credit counting and vending-machine communication. Ideal for applications independent of mains supply with low power consumption. With "Teach Mode", tokens are able to programmed on site. Can be configured for two individual settings with 2 x 12 channel technology.